A large brick paver driveway in Jacksonville FL featuring the plaza series 12 x 12 pavers with a double 4 x 8 border. Mahogany Ash color with Taupe. A brick paver driveway project in Jacksonville FL. 4 x 8 pavers in a 45 degree herringbone pattern. Upright pavers for bed edging. Timberwood color. Paver patio featuring a circular paver inlay. The surrounding pavers are Mega Olde Towne in Sierra, te inlay is Cappuccino. This photo shows the transition of a paver driveway into a paver walkway with bed edging. The pavers are bordered with a 6" x 9" soldier course. A paver driveway in Ponte Vedra beach FL featuring a traditional 4 x 8 pavers in a Herringbone patter. This paver is from Oldcastle South in Biscayne color. Brick paver driveway construction in Jacksonville's Deer Creek Golf and Country Club. These pavers are Olde Chicago color in Mega Olde Towne. A paver patio showing Oldcastle's Harvest Blend pavers installed in a T Pattern. The pavers are bordered with the rectangular 6 x 9. A raised paver patio is suitable for a yard that slopes sharply away from the home. This patio uses Appian combo pavers in a T Pattern. Seating wall surrounds this pavers patio to give it a soft feel and nice look. The pavers are 3 piece Olde Towne in the Timberwood color. The screen room encloses a paver patio with an outdoor kitchen and seating wall. The pavers are Belgard in Amaretto and Brown Chestnut. Traditional 4 x 8 pavers on a new Jacksonville paver patio installation. The paver colors are a blend of Red and Charcoal from Oldcastle called Adobe. Stonegate wall makes the slope of this oceanfront home more functional. The retaining wall segments are 6" tall. Vilano Beach paver Installation. This paver pooldeck has an infinity edge. The steps lead to a lower paver patio. The pavers are Belgard from Oldcastle. Oak Run color. The Bishops Hat is a paver shape that also uses a corresponding square inlay paver to make intricate patterns. Cappuccino with Taupe. Jacksonville paver driveway contractor. This drive has 4 x 8 pavers in Herringbone pattern. Riverwood color with blends of Sand, Tan, and Taupe. Paver walkway that leads to an entryway in Kobble pavers. The color blend is White, Tan and Charcoal. Border pavers are Charcoal 4 x 8. This Jacksonville pavers patio is constructed in a circle using a circular paver pattern. 3 tier seating and riser wall. Sierra color wall and pavers. Running Bond is the pattern of the walkways that lead into a circular paver transition area. The pavers are Olde Towne and the color is Sand Dune. Blending the walkway to the driveway with a nice flowing curve is a nice touch for this Jacksonville paver driveway, walk and entry. Paver patio and seat wall featuring Timberwood color Stonegate wall and Cappuccino color Olde Towne pavers. Orange Park Fl. Olde Towne pavers in a 3 piece random pattern on this driveway installation. The Sierra color is a blend of Sandstone, Tan, and Charcoal. This paver driveway uses tumbled Sand Dune 3 piece Olde Towne pavers in a random layout. The border is also tumbled in a solid Tan color. The pattern here uses 3 sizes of pavers laid alternately in both directions. The color of the field is Cappuccino with Taupe bullnose coping. A new paver driveway in Queens Harbor with Olde Chicago color pavers with a dark Charcoal border. The pavers continue to the front porch. Paver patio and walkway installation utilizing 4 x 8 pavers in a Herringbone Pattern. The paver color is Heritage, a mix of Red, Tan, and Charcoal. A paving stone walkway installation using the three piece Olde Towne pavers in Olde Chicago color. This project is in Jacksonville FL. 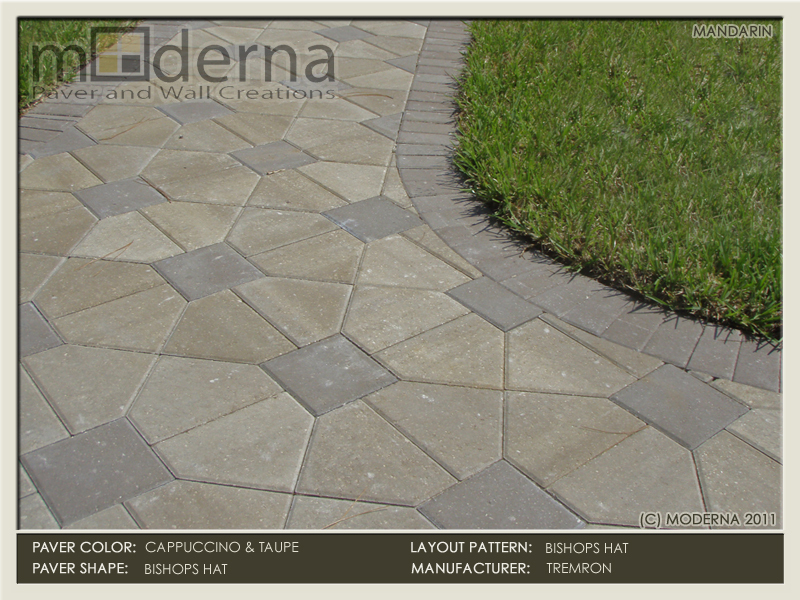 All paver & other photographs, audio and video clips, hardscape pictures, images, graphics, landscape design & all items contained on the website, are copyrighted & may not be used in any manner without Moderna's prior written permission. Copyright © 2012 Moderna, LLC.